Few countries have developed as quickly as India has in recent years. This country, which, for much of the 20th century, was considered a struggling, impoverished South Asian nation, has emerged as a major economic and political force on the global stage over the last two decades. India’s economy is currently the 10th largest in the world by Gross Domestic Product, and is on track to eclipse the economies of several developed nations over the next few years. With over 1.2 billion people, India is the world’s largest democracy and the second most populated country on Earth behind China. India is the home of the ancient Indus Valley Civilization, and it is the birthplace of four major religions. For much of its long history, the country has been widely regarded for its rich arts and cultural heritage. India’s capital city of Delhi, located on the banks of the Yamuna River, has been continuously inhabited from at least the 6th Century BC. Today, the city is the second most populous metropolis in India behind Mumbai. Other major cities in India include Chennai, Bengaluru, Hyderabad and Kolkata. Much of India’s recent growth has been the result of progressive economic polices and liberalization measures that were put into place during the early 1990s. Many of the strictures that used to exist on foreign investment and foreign imports have been removed, and the investments the country put into education and technology have begun to pay off. 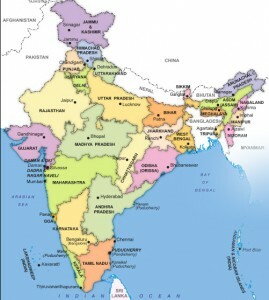 India, today, is widely regarded as a sort of back-office for many of the world’s largest companies. Its information technology industry last year generated more than $120 billion in revenues by handling software development, business processing, research, and technology development tasks for companies based in the United States, Europe and elsewhere. International shipping to India is a lot easier these days than it used to be a few years ago, though the country still imposes fairly heavy import duties and taxes on most foreign imports. Those looking at shipping a car to India, or shipping a car from India, should consider using a licensed import-export broker or an India international shipping company to handle the task. Before shipping a car between the two countries, potential importers also need to consider the fact that Indian vehicles have steering wheels on the right hand side, unlike American vehicles which have them on the left hand side. Both countries also have different emissions standards and safety requirements, so it may not always be easy or possible to import a car between the two countries. India international shipping companies transport cars in containers or on board purpose-built car carries known as Roll-on Roll-off (RoRo) ships. Container shipping costs can vary widely depending on where the car needs to be picked up from and dropped off, the make of the car, and the time of year it is being shipped. Average prices for container shipping to India from the U.S. East Coast vary anywhere from $1,750 to over $3,000. RoRo shipping options typically tend to cost less than container shipping. However, RoRo services tend to operate on a less frequent basis between the two countries compared to container ships.